Hike Black Rock Mountain State Park in North Georgia to stunning mountain views on the Tennessee Rock Trail, climbing through a beautiful wildflower-filled forest. Black Rock Mountain State Park is Georgia’s highest elevation state park, soaring high above the surrounding terrain and the nearby North Georgia city of Clayton. High elevation mountain summits often deliver stunning views, and this park doesn’t disappoint: the park’s visitors center and hiking trails offer lofty, long-range, take-your-breath-away views. The park’s most popular hike, the Tennessee Rock Trail, catches stunning views from the Tennessee Rock overlook and visits the mountain’s shady, tree-covered summit. While the overlook views are breathtaking, much of the trail explores a gorgeous, high-elevation forest that’s filled with boulders, wildlife and towering trees – and in spring, a dense carpet of native wildflowers. From summit to slope, the Tennessee Rock Trail is easily one of North Georgia’s most beautiful trails, especially under three miles. 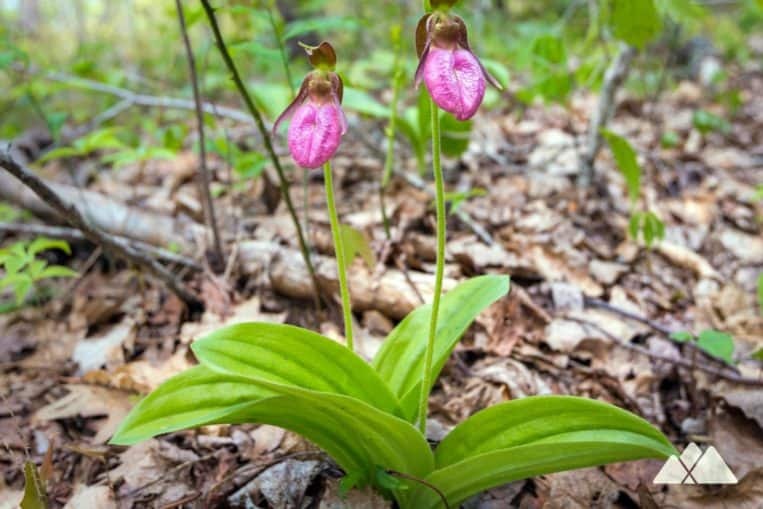 This section of the Tennessee Rock Trail is exceptionally beautiful in late Spring, when wildflowers and fern blanket the forest floor, shaded by towering trees above. The forest is covered in bright, spring-green hues as young fern unfurl, stretching to reach the dappled sunlight overhead. 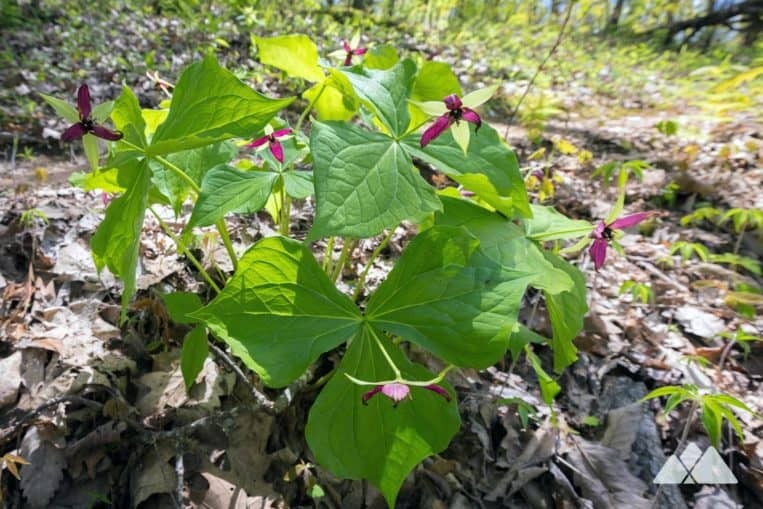 Trillium bloom in the tens of thousands here on the mountain’s lower elevations, easily spotted by their distinctive petals and leafs in a pattern of three. The trail reaches a side loop trail at .6 mile, hiking the short loop to a boulder-covered slope covered in vibrant green moss. The side loop re-joins the Tennesee Rock Trail, hiking westbound and descending elevation. 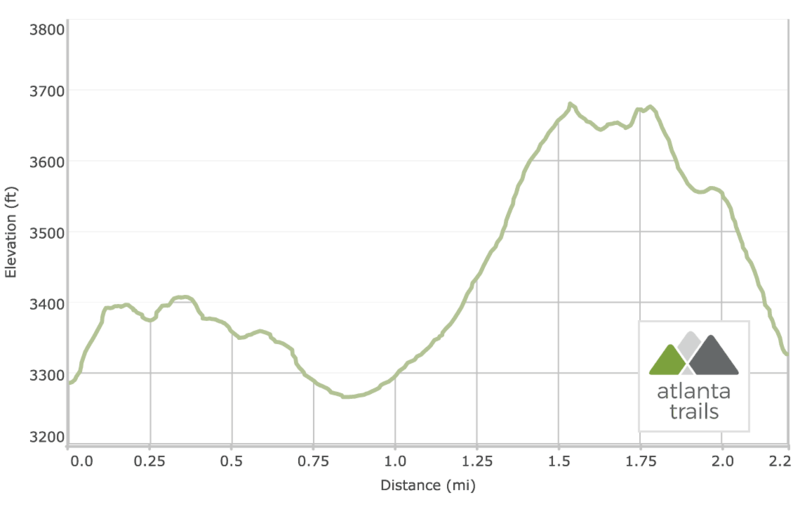 At .85 mile, the trail begins a steady, unwavering climb to the mountain’s summit. The deciduous forest gives way to pine, the trail covered in pine needles as it climbs. Tall grasses line the sides of the trail. The hike reaches an intersection at 1.2 miles, where a gravel road turns to the right; the Tennessee Rock Trail veers left, continuing its climb to the summit. The trail rises through a lush, green forest filled with fallen trees, the remnants of a 2011 tornado. Between-the-trees views extend on the right at 1.4 miles as the Tennessee Rock Trail nears the summit. The hike reaches the summit of Black Rock Mountain, marked with a large engraved stone, at 1.55 miles. At the tree-covered summit, views are sporadic between the trees – but not to worry, the hike’s best view is near. The trail rolls elevation from the mountaintop before climbing wood stairs, reaching the Tennessee Rock overlook at 1.75 miles. 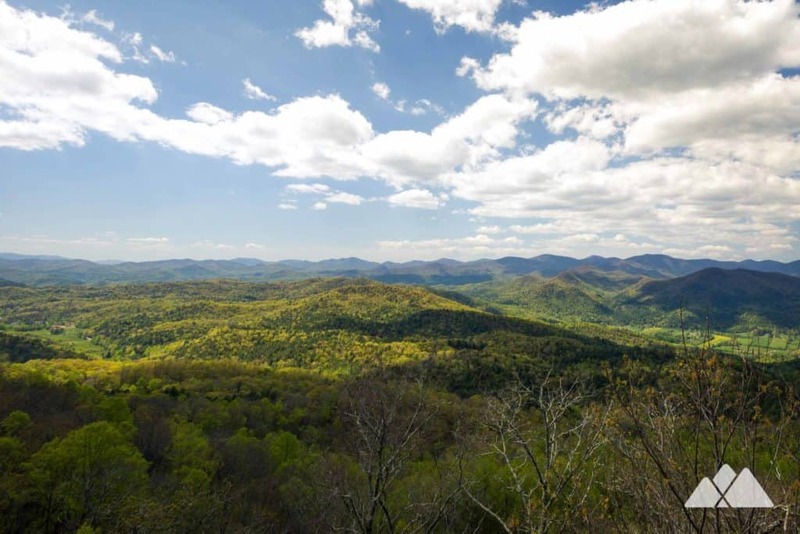 Views of the rolling southern Appalachian Mountains stretch to the north, extending toward the summits of Albert Mountain and Pickens Nose Mountain in nearby North Carolina. Blue sky meets hazy blue mountains and vibrant green forest in a view that’s nothing short of spectacular. Departing the Tennesee Rock overlook, the hike begins a steady descent northbound toward the trailhead. 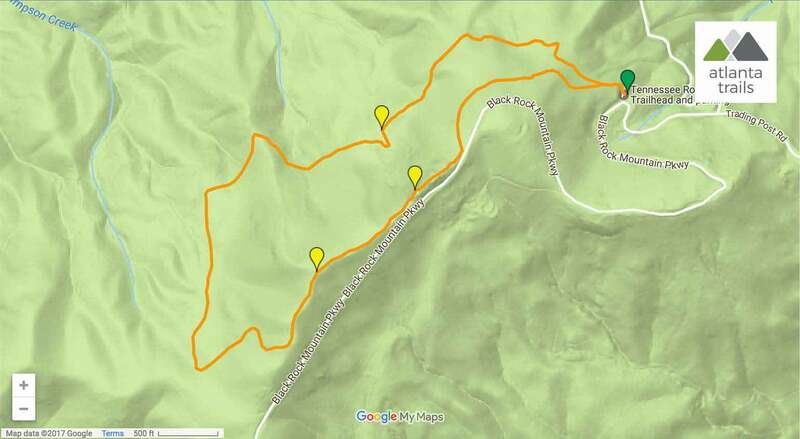 The adventure completes the loop portion of the trail at just over 2 miles, veering right to hike the spur trail to the trailhead and completing the hike at 2.2 miles. Please note: this park is closed from December 15 through March 15 every year. Loved the trail? The neighboring Edmonds Backcountry Trail is considerably more difficult and longer than the Tennessee Rock Trail, but it’s well-worth a hike. The trail rolls elevation to multiple mountain summits and dives into a creek-filled valley, visiting a waterfall. It’s also a great backpacking trail, offering a number of campsites (reservations required) along its length. There’s a mountain with a similar name around 40 miles to the north, in North Carolina. Blackrock Mountain towers nearly 6,000 feet in height, and scores stunning 360-degree views of the Great Smoky Mountains after an exceptionally difficult hike from Pinnacle Park. The route to the summit makes for a great workout, and the views are simply incredible. $5. This park is closed from December 15 through March 15 every year.